Take an online course and get certified. It’s that easy! Take one of our proven effective online Train the Trainer courses and take the certification exam tied to that course. If you purchase an online course through our site today, the certification is free! The certification exams are online, allowing you to complete the exam without leaving the comfort of your home or office. Train the Trainer certification exams can also be taken after completing a Rule the Room course on Udemy or other learning platform. If you’ve taken a Rule the Room Train the Trainer course on an outside platform, you can purchase the certification exam today. Explore our certifications below and become Train the Trainer certified today! You’ll learn how to train a classroom of adults, all while keeping their attention and maximizing learning. This Train the Trainer program is perfect for an individual looking to command a room in a training or corporate environment. 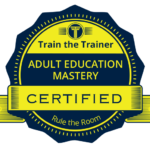 Take the adult classroom training course today! Develop a curriculum that will make your audience engaged and will ensure they retain the information you’re teaching. You’ll learn how to take control of the Curriculum Life Cycle and produce top-notch training. Take the curriculum design training course today! Find easy and effective ways to create adult training and education programs. This process takes you through everything from hooking the class to creating incredible training materials. Take the adult education training course today! This course teaches trainers how to ENGAGE. This Train the Trainer program takes your through the steps you need to be the trainer that leaves a lasting impact. Take the train the trainer techniques course today! Once you’re an expert trainer, you can train other coaches and trainers. Take this course to learn how to take control a room of trainers. Take the training coaches expert course today! Training via an online platform can be overwhelming and the tools needed to engage virtual students are unique. This course will train you how to take control of an online classroom. Take the online teaching training course today! Create and deliver killer presentations with these tried and true techniques. The skills learned in this course will allow you to take over a board room, classroom or sales presentation with style. Take the presentation skills training course today! Formulate and facilitate classroom activities that drive learning and engagement. Take the adult classroom activity training course today!